The default view of Performance Mode is Contact Flow Report for all time. For more information on all the reports available, see our article on Performance Mode Reports. You can filter the Performance Mode views using these different reports, adding date ranges, and lead source tracking to fine tune the results. Triggers in your Campaign add contacts based on the criteria you set. When you use Triggers for lead sources such as Facebook or Adwords Ads the lead source is tracked. 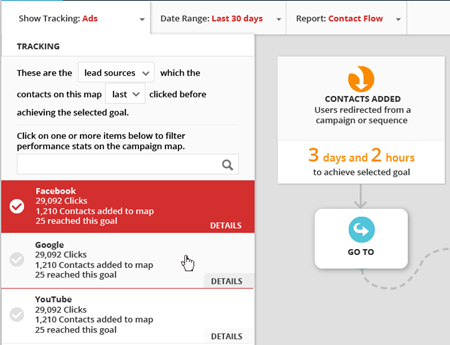 In this image, the Ads Tracking group displays the clicks, number of Contacts added to the Campaign, and how many reached a particular Goal.